British number one Anne Keothavong saw her hopes of a first WTA final come to an end with a 6-7 (3-7) 6-1 7-5 defeat by Elena Vesnina at the ASB Classic. From 5-3 down in the Auckland semi-final, Keothavong won the first set on a tie-break with a scorching backhand. Vesnina hit back in style, however, winning the next set 6-1 in 39 minutes. A fortuitous net cord saw Vesnina break in the decider, and despite spurning four match points, she secured a place in the final against Elena Dementieva. Keothavong was incensed by a contentious line call that went against her and led to the first break of the final set, in the seventh game. After remonstrating angrily with the umpire, the Briton recovered back to 5-5 on serve, but then suffered the misfortune of Vesnina's forehand dropping the right side of the net. She saved two match points when Vesnina served at 6-5, and 22-year-old Vesnina then had to save two break points of her own before she sealed victory with an ace in the match that lasted just under three hours. 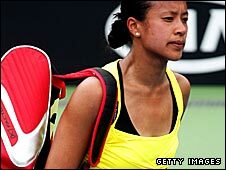 "I'm obviously really disappointed about today's result but I'm not going to beat myself up about it," Keothavong told her website. "It was a big match for both of us for a place in the final and I guess there were a lot of nerves out there and I got quite emotional because I wanted it badly. "There are lots of things I could've done better but what's done is done now and I need to regroup and get ready for my next tournament in Hobart which starts on Sunday." Top seed Dementieva earlier wasted little time in defeating last year's finalist Aravane Rezai of France 6-2 6-2 in just 66 minutes. It is only the second time she will have faced compatriot and doubles partner Vesnina. Dementieva won the first encounter with a three-set victory at S'Hertogenbosch in 2006.